we have user jane.. she wants to print some photos she has stored in flickr. moo can do it for her. < timbl > How does flickr know what moo's key is? < tlr > I like the separation between authorization and identity here. < drecordon > As tokens can be revoked, they could automatically be revoked by jane's provider at a given time if you wanted. signatures are not just limited to HTTP. such as the token, a nonce, timestamp, signature, oath version, etc. < tlr > ralph, to check the signature the server needs to reconstruct the URI as well. david: the consumer key could be provided by your service provided (flickr). This is up to the service. It could be provided off-band. < drecordon > From 4.2 "The Service Provider’s responsibility is to enable Consumer Developers to establish a Consumer Key and Consumer Secret. The process and requirements for provisioning these are entirely up to the Service Providers. " timbl: wondering if user could be more aware of redirects, rather than making it so transparent inside the protocol. Make for example a pop-up "login admin window" dialog box that warns the user what will happen next. Would this be useful? < Ralph > blaine: "the consumer key can be trusted"
< ericP > ericP: consumer keys (and their backing contracts) can be used against phishing. < ericP > ... i imagine consumer keys by tier + identity, some delegatable. < ericP > ... since this has no analog in basic auth, what use cases were driving this? ericp: consumer keys and contracts could be used for phishing. We have identities separated from contracts. We can authenticate someone and then relate them to contracts. What was the use-case guiding this? what were your goals? < timbl > Presumably there could be links from the flickr OAuth page Jane has to log in on which could have details or it all. david: flickr could also tell Jane "hey we're not really sure if moo is moo. Are you sure yourself before proceeding?" rigo: is your service privacy aware? What happens if flickr refuses to grant a token? What's the liability issue status? Have you talked to lawyers about this? < Ralph > Rigo: what about privacy? Have you talked about liability issues with lawyers? < dom > can oauth support an authentication broker between flickr and moo? < tlr > drecordon, why can't you have recursion in the authorization interaction? rigo: putting central entities is good for security, but it's not good for privacy. e.g. flickr could blackmail moo as far as they want. < dom > can we timebox that discussion, please? < drecordon > @tlr, I bet that you could. It just wasn't designed to do so. < drecordon > And yeah, you could stack them but then you have the user bouncing through multiple layers of redirects as the tradeoff. < drecordon > @riko, I think it is more that as OAuth was being created there weren't members in the community who advocated for these sorts of use cases. timbl: this is a problem with openid. There are difficulties to use it from an ajax program. 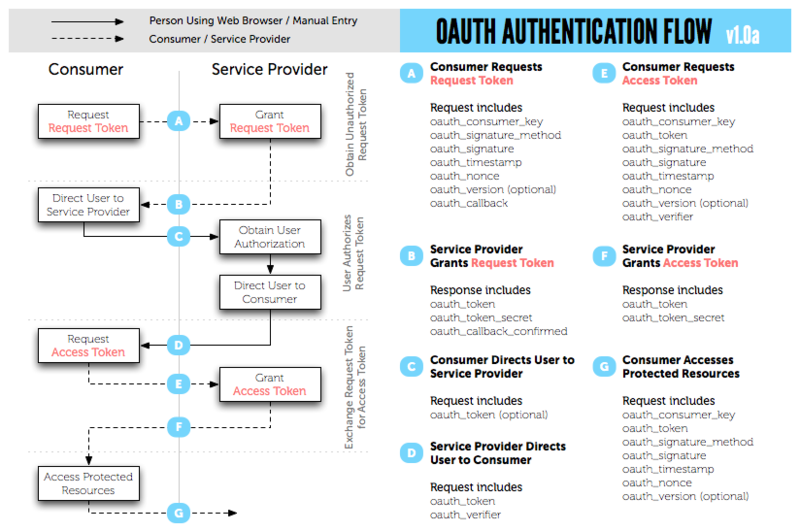 How does oauth stands here? How far can we separate the human from the redirects, how much can we tell them about them? david: oath requires redirects right now, but you could do it without redirects at some time. timbl: it would be nice to separate the authentication from the authorization. < drecordon > @Yves, I think that is an overstated trend. Relying Parties more than tripled last year up to over 30,000 public sites that accept OpenID sign in. The large companies generally start by being a Provider – which is the trend people see – but largely followup with becoming a RP as well. dom: how much oauth can work on mobile devices? What's the impact on speed, constraint networks? < tlr > I think we can't solve it, just like we can't solve people falling for liars in real life. < tlr > But we might be able to make things easier. < tlr > I'm not at all suggesting that "give me your user name and password" is better than oauth. < timbl > If the browser warned you when you entered the same password for two different sites, taht might help two things. timbl: what may keep you from using the same password on two or more sites? Should the browser warn the user? < sandro > isn't OpenID the right solution to the many-passwords problem? < DanC > why not, tlr? < tlr > because it has its own set of problems. < DanC > tlr, I'd like W3C to deploy OpenID all over, and I gather you're advising against. I hope to get to the bottom of that some time. < sandro > can openID be fixed, TLR, or is the concept fundamentally broken? < dom > s/phishing sites/bank sites/ no? < jose > plh: are there any IPs around oauth? what is your patent policy with re it? plh: are there any ipr concerns around oauth, was there patent disclosures of the participants? plh: it was individuals or their organizations that made the disclosure? < drecordon > The OAuth license has been signed by AOL, Citizen Agency, Google, Ma.gnolia, Pownce, Six Apart, Twitter, Wesabe, Yahoo!, and the individual contributors. ralph: are those public knowledge?